Remember Zeebox? You know, the NBC and Comcast-backed app that promised to bridge the gap between television and social media? You could be forgiven for forgetting - the app warranted exactly one post from us 18 months ago, and hasn't made any significant changes to get back on our radar. 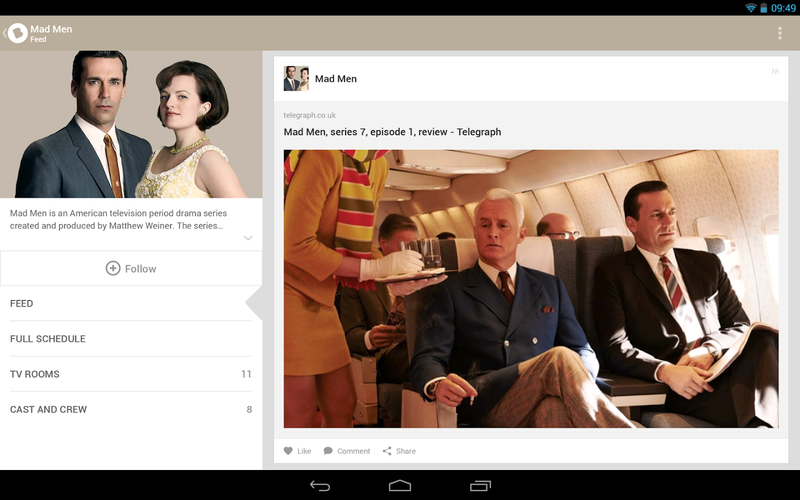 Today the app has been re-branded as "Beamly," a move announced with a swanky app redesign. All the core functions of Zeebox seem to have made it over to the new Beamly app: the basis of the experience is still the TV schedule, which will learn your tastes and recommend new shows. Users can get a quick look at the social buzz for each show on Beamly's integrated social network, which is basically a fancy comment and tagging system. You can "follow" both the shows themselves for online stories (mostly celebrity gossip and spoiler-rich blog posts) and other users for some viewer chat. To help promote the re-launch of "Beamly by Zeebox," the creators have announced a series of TV Rooms (chat rooms) hosted by celebrities that I've never heard of. These include "reality star Kandi Burruss of 'Real Housewives of Atlanta' fame and YouTube sensations like Tyler Oakley, Sawyer Hartman and Kalel Cullen," which the press release calls "Influencers." Think of that what you will - I'm more likely to take show recommendations from the people I know in real life. NEW YORK, LONDON and SYDNEY, April 14, 2014 /PRNewswire/ -- Beamly (formerly zeebox) launches today on iPhone, iPad, Android and the web with a new brand and a vibrant, exciting new app representing the state of the art of social television. 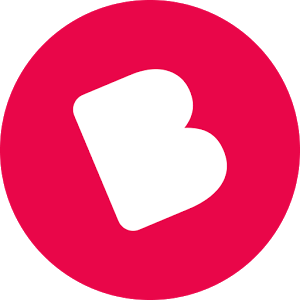 "The rebrand to Beamly is a celebration of the huge development our app has been through since launching two years ago, originally as a simple program guide and synch experience," said Ernesto Schmitt, CEO and co-founder. "The initial phase of social television and 2nd screen was limited to apps providing a companion experience for audiences while watching TV. However, people's emotional engagement with TV spans the whole day: they want to read up on stories about the shows and stars they love in the morning, discuss plotlines over the watercooler in the afternoon, and carefully plan what to watch in the evening – long before ever switching on the TV itself. While they watch, they want a great interactive experience that synchs with what's on screen. And after the show is over, they want to chat and share socially with other fans," said Schmitt. 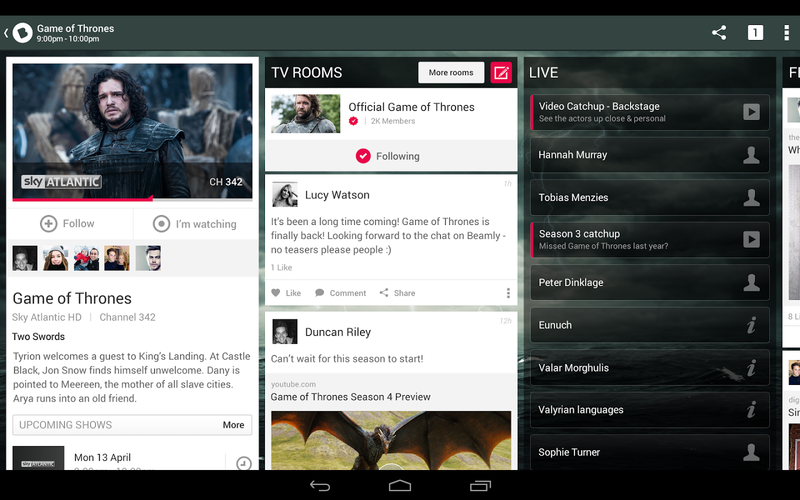 "Beamly for the first time brings together all of these touchpoints with TV in a single app, all day long." Anthony Rose, CTO and co-founder said: "We've already seen a marked progression in the behaviors of users since gradually introducing our new social features over the past few months. The social effect of users following other users, for instance, lifts frequency by 9x to over 21 visits per user per week, and usage to over 500 minutes per user per week – so we're pretty excited. And since almost 2/3rds of our users are now female, and the 16-24 age bracket is our core, the new Beamly brand captures the zeitgeist of these millennials perfectly." To mark the launch, Beamly welcomes on board over 100 TV and pop culture influencers who are hosting their own live, vibrant TV Rooms and profiles in the app. Across Grammy Award Winning Songwriter/Singer and reality star Kandi Burruss of "Real Housewives of Atlanta" fame and YouTube sensations like Tyler Oakley, Sawyer Hartman and Kalel Cullen, Beamly users have the chance to connect and interact directly with TV Influencers that matter to them – while talent has the opportunity to express their own TV passions, while building followers and connecting with their fans in a ways not possible on other social platforms. "What I like about Beamly is it allows me to connect with my viewers around TV shows that we're passionate about anyway," said Tyler Oakley whose YouTube subscribers top 4m. "It's just another way for us to connect in a more intimate way." "I love the idea of being able to follow and connect with fans around our show and all the other shows I'm obsessed with," explained Kandi Burruss. "You'll definitely find me in the 'Scandal' TV Room and look out for some of my new wedding pics in the 'Atlanta' TV Room later this month!" Existing partners like NBCU and Viacom as well as new TV network partners can also syndicate Beamly's rich interactive capabilities. These include TV rooms for vibrant show specific communities that fans can engage with on the .com page of a TV Network and a rich suite of gaming experiences that networks like Bravo and Oxygen are enabling. Beamly is available free from the App Store for iPhone and iPad, Google Play for Android, on the web at http://beamly.com/– and coming soon to Windows Phone.